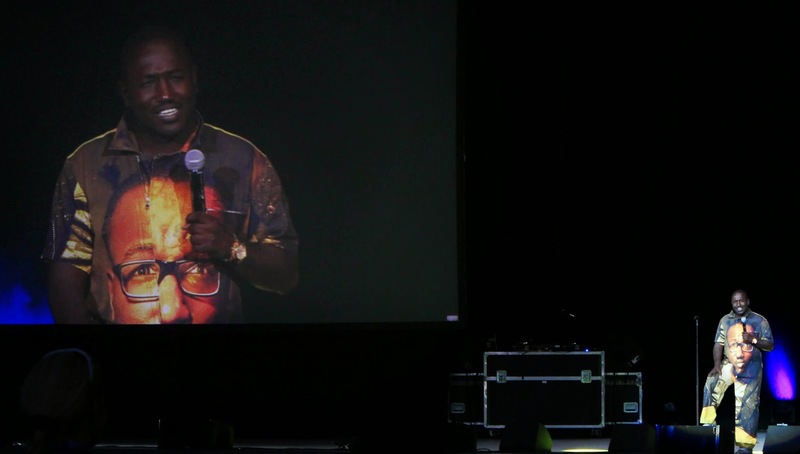 The Oddball Comedy Festival came to the USANA Amphitheater in Salt Lake City on Saturday, September 6th. While the line up varied from city to city, Salt Lake's lineup was a great as we could have hoped for. 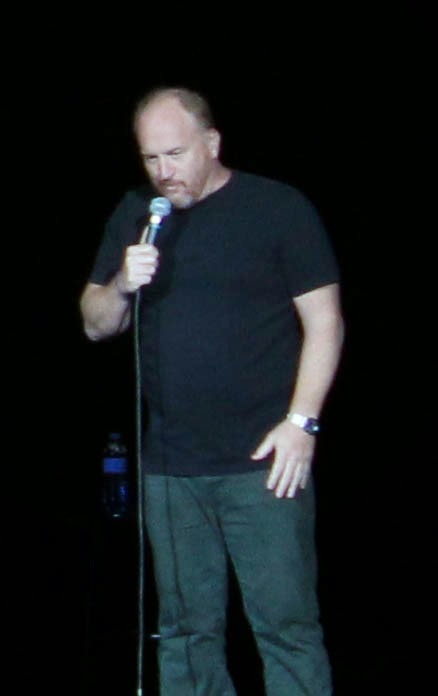 The Salt Lake show featured Jeff Ross, Whitney Cummings, Chris Hardwick, Demetri Martin, Hannibal Buress, Sarah Silverman, Aziz Ansari, and Louis C.K. It was weird to be at a comedy show that started with the sun still out, but once the comic hits the stage they didn't disappoint. From the crowds energy you could clearly sense that we were about to take in one of the best comedy shows we would ever see. 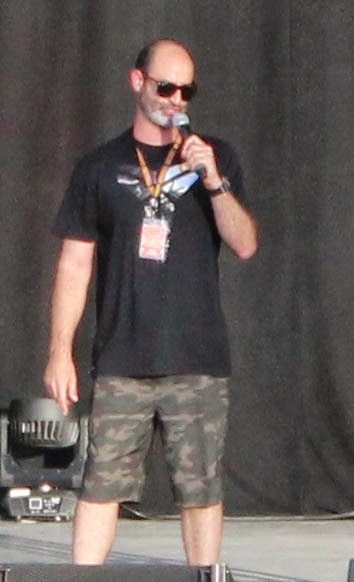 Brody Stevens of Funny or Die welcomed the crowd to the festival. He told the crowd about talking with Will Ferrell about bringing the show to Salt Lake City and entertained the crowd before welcoming our first comic, and host for the evening, Jeff Ross to the stage. 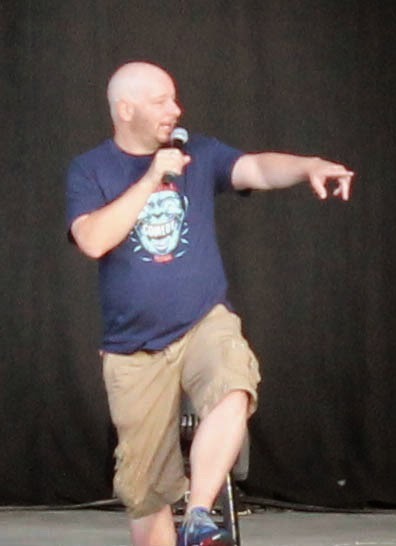 Jeff Ross, best known as the Roast Master for his Comedy Central Celebrity Roasts, took the stage showing off a new look for himself as he had shaved his head. 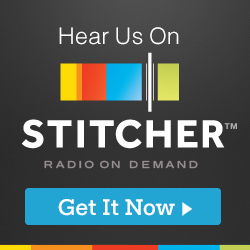 Jeff's show wouldn't be complete without having him roast somebody at the show. Jeff invited several members of the audience on stage to subject themselves to the verbal blows of Roast Master. The roast members were well humored and gave Jeff Ross all he could have hoped for. The crowd enjoyed being able to see Jeff do what we have all grown to love him for as the Roast Master. Following Jeff's set, the hilarious Whitney Cummings took the stage. Whitney is best known for her NBC sitcom "Whitney" and as the writer and creator of the CBS hit, "2 Broke Girls". I have had the opportunity to see Whitney perform several times in Los Angeles, but she never disappoints! Whitney talked about relationships and where she is at in life. Whitney's set was sadly only 15 minutes. I really wish we could have had a lot more of Whitney Cummings comedy. As Whitney wrapped up her set the king of Nerdist, Chris Hardwick took the stage. The audience gave Chris a warm welcome as the @midnight and Talking Dead host walked on stage. 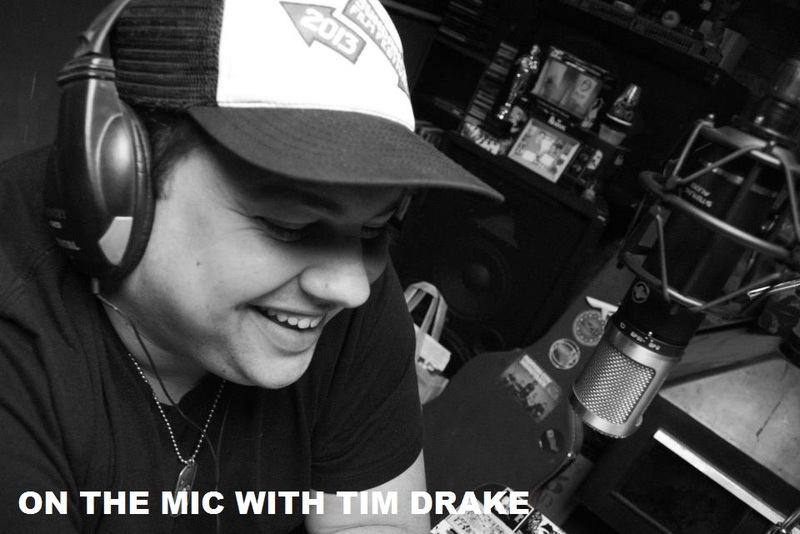 Even though Chris had just performed at WiseGuys Comedy a few months back, he kept his set fresh and interactive. After only being on the stage a few minutes, Chris climbed down from the stage to join the crowd and see the fans. Chris' set also talked about the recent death of his father, the legendary Bowler Billy Hardwick. Following both Chris and Whitney's sets I was able to talk with them for a few minutes. I've met Chris several times and he is always one of the nicest guys and always willing to talk for a few minutes. Even though I have seen Whitney perform several times, this was the first chance I had to meet her. Whitney was absolutely sweet and great to talk with as well. Following Christ Hardwick's set, the always hilarious Demetri Martin took the stage. Demetri brought his quick, witty comedy and of course his guitar to his stand up show. Demetri's set was everything his fans have expected. It was strong from the start and left everybody in stitches. I saw Demetri several years ago when his stand up career was first getting off the ground. It was great to see him perform live again. 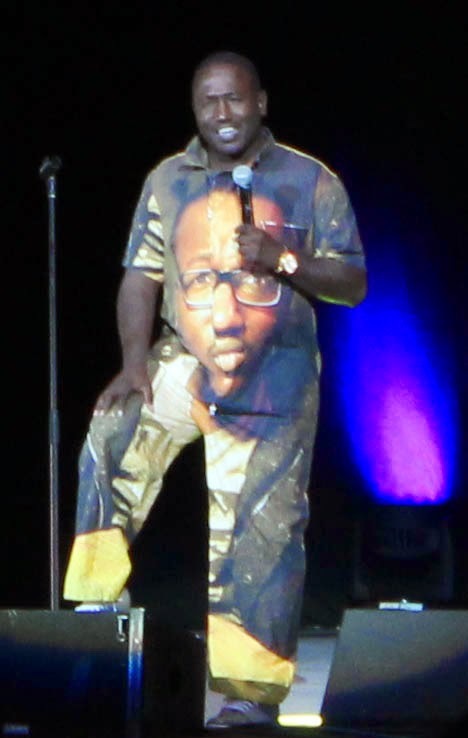 Hannibal Buress took the stage next, wearing a one piece jumpsuit with his picture printed on it. Hannibal's fans were loud and ready for their favorite comic. This was my first time being able to see Hannibal and he didn't let me down. I laughed from the minute he took the stage in his jumpsuit to his last joke. It was a thrill to see Hannibal perform live and I can't wait to see him return to Salt Lake City. Hannibal's set was the last set before a short intermission in the show. Following the intermission, the great Sarah Silverman took the stage! Sarah is another comic that I have had the chance to see perform in Los Angeles a few times before, but her set was as solid as ever. Sarah walked down from the stage early in her set to visit with the crowd. Her crowd work was absolutely hilarious, sitting on fans laps and surely making some of those guys year. Sarah's set is a small glimpse inside her Emmy winning special "We are Miracles", that comes out September 23rd. As Sarah left the stage. the powerhouse comics just kept coming. Aziz Ansari from NBC's Parks and Rec took the stage next. I feel that Aziz has reached a point in his stand up where he can't stop writing great comedy. It's rare to see a stand up that can continually write a new hour every year or every other year. Aziz has quickly started to become one of these comics. Following his Netflix's special last year, Aziz hit the stage with fresh material and kept the crowd laughing until the end. 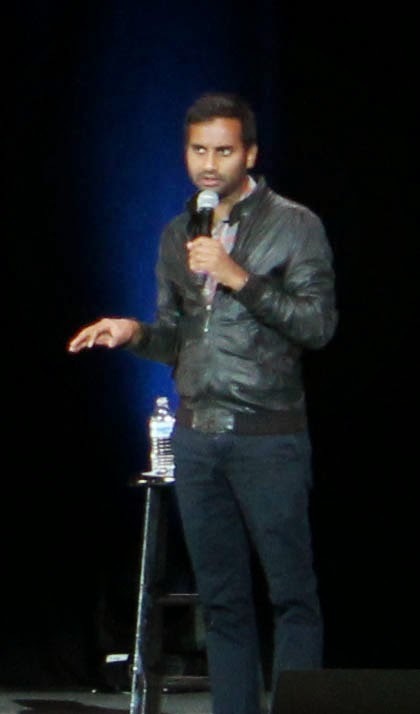 Aziz's set still consisted of talk about relationships, vegetarians, his heritage and more. Towards the end of Aziz's set the rain started coming down at the show. Aziz's set was great and left me wanting more. Aziz was the last comic before our headliner, Louis C.K. The crowd was eager to see Louie and let him know as soon as he took the stage. The rain kept coming as Louie took the stage. He quickly addressed the rain and made fun of having to perform in Utah. Louis stepping out to the rain and checking it out. Louie's set was everything I had expected. It was aggressive yet light hearted just as we have come to expect from him. 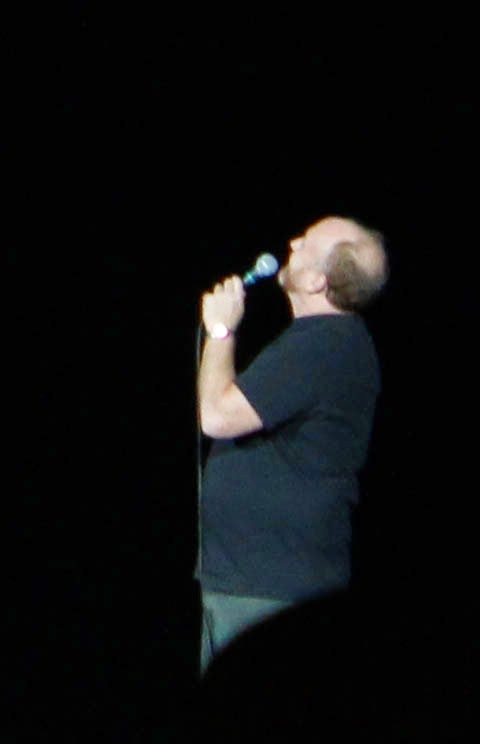 Many fans were thrilled to finally be able to see Louis C.K. live and in person. It was a moment that I didn't think I would get a chance to see and was thrilled to be able to see him perform. The Oddball Comedy Festival was an amazing time and something that every comedy fan needs to experience. Thanks to Funny or Die and all of the comics for bring the show to Salt Lake City. I can't wait to see who they bring next year!